I used to live in Mainz between 1973 and 1982, first as a student and later as an Assistant Professor at the University of Mainz. Student life was great there. We would finish up basically every evening in one of the many wine taverns, where you could have a couple of glasses of decent German wine and some basic regional food at reasonable prices. One of the many favorite hang-outs was Weinhaus Bluhm. The following nearly 30 years, I spent as an international civil servant at the International Monetary Fund (IMF) in Washington DC and at external posts in Madagascar, Croatia and France. When being stationed at headquarters in Washington DC, my work consisted of doing technical assistance, economic review or program negotiations missions to the 180 plus member countries of the institution. These missions took me basically once every other month on a stop over for a couple of days to the Frankfurt International Airport. In addition, we spent a considerable part of our annual leave in Germany. So, I had plenty of opportunities to stay in touch with the wine scene in the greater Frankfurt am Main area, including Mainz. But Weinhaus Bluhm became one of the wine taverns I would not visit anymore on my stop-overs or when on annual leave in Frankfurt. This changed radically, when I retired from the International Monetary Fund and partially relocated to Germany. I soon got the tip that Weinhaus Bluhm had a new owner and had become the Wine Mecca of Mainz. After several decades, I rediscovered Weinhaus Bluhm in Mainz. This posting is being published as part of the Weinrallye, a monthly blog event in Germany. Participating wine bloggers - mainly in Germany - are all releasing postings today under the heading "Wiederentdeckt" (Rediscovered). Weinrallye is the brainchild of Thomas Lippert, a winemaker and wine blogger based in Heidelberg, Germany. 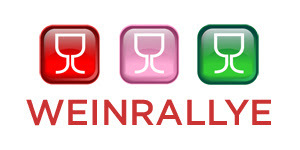 This month's wine rally is organized by Julia Richter from the food blog German Abendbrot. Starting with the setting and atmosphere, Weinhaus Bluhm is a dark, a bit smoky, very basic tavern. It looks today the same as it looked when I first set foot into the Weinhaus Bluhm as a student of macro-economics at the Johannes Gutenberg University in Mainz. The furniture is functional, used, a bit worn down. Weinhaus Bluhm offers a feeling of well-being and it has a lot of charm. In the summer, you can sit on the cobble stone road outside the tavern on communal benches. It cannot get better. Remember, all tables in wine taverns are communal tables. You sit with strangers at the same table and are expected to communicate with everyone at the table. Therefore, people also choose a wine tavern for the people they expect to meet and talk to in the tavern. Weinhaus Bluhm used to be a popular hang for young people with little money and the fans of the local football club Mainz 05, not necessarily interested in wine. This has changed over the past years since Silvia and Roland Ladendorf have taken over and shifted the focus to top class wines. It has become popular with people from the regional government (Rheinland Pfalz), professors of the Mainz University and journalists of the ZDF (one of the two large state channels in Germany). My hunch is that the quota of these people is rather high. The quota of out of town people and tourists appears to run close to zero. The food at Weinhaus Bluhm is simple and very good. It does not reach out for some sophistication, as some of the other wine taverns do. It stays at the more basic range, but at the highest quality level. I can recommend the Mainzer Spundekaes for Euro 4.80, with lots of Bretzels. My wife had the Fleischwurst mit Brot for Euro 4.80 and our friend ate the Handkaes mit Musik for Euro 4.90. Only cold food is served, with the exception of the Rippchen mit Kraut for Euro 5.80. All is prepared in the small kitchen and served by Silvia Ladendorf. This leads us to the wines served at Weinhaus Bluhm. Here it really stands out, it is a class of itself. Nowhere else in a wine tavern in Mainz you can get wines from German wine stars like Weingut Klaus Peter Keller or Weingut Kruger Rumpf or Weingut Teschke. Roland is a wine aficionado and extremely knowledgeable about the wine scene. And what is most important, you can get a fair number of his world class wines by the glass. Of course, you can have a decent white wine in a typical Mainzer Stange, i.e. in 0.25 liter glass for around Euro 2.50. But you can also have the entry-level wine of Klaus Peter Keller in the 0.2 glass for Euro 4.50. And, you can have, for instance, a Klaus Peter Keller top wine in the 0.1 glass for Euro 4.50. In addition to the large selection by the glass, Weinhaus Bluhm offers about 150 wines by the bottle. “I have all the wines of Klaus Peter Keller and Philipp Wittmann on my wine list” says Roland Ladendorf. Roland Ladendorf is a wine enthusiast. He has put much thought into his selection of wines which includes both famed and lesser known producers. Most of the producers he knows personally. He is very passionate about his wines and this is one of the reasons that make Weinhaus Bluhm a very special place. Before taking over Weinhaus Bluhm, Roland Ladendorf was a fruit and vegetable importer in the Frankfurt Grossmarkthalle. He was born in Gonsenheim, a suburb of Mainz. Roland is really passionate and a loves his wines. He can guide you through the evening or afternoon. When I go there, I just let him choose the wines. He would start at an entry-level wine and then during the course of the evening take me to his high-end wines, all by the 0.1 liter glass, the Piffchen as the people in Mainz say. Bistro Vivant in McLean, Virginia (USA), known for its excellent French cuisine, hosted a special evening with Eric Bonnet, Winemaker and Co-Owner of Domaine La Bastide Saint Dominique, located in the Rhone region of France. We enjoyed a five-course menu, prepared by Co-Owner/Executive Chef Domenico Cornacchia (Assagi Osteria, Assagi Mozarella Bar and Bistro Vivant) and his new Bistro Vivant Chef Ed Hardy. It was a lovely evening with great wines and food, all well-orchestrated by Bistro Vivant Co-Owner Aykan Demiroglu and General Manager Shannon Paretzky. The event was initiated by The Vineyard Wine Store in McLean. The prices below are The Vineyard prices for single bottles. Domaine La Bastide Saint Dominique is a family-owned winery in Courthézon in the southern part of the Rhône Valley in France. It is owned by Gerard and Marie-Claude Bonnet, with their son Eric Bonnet, who visited us, as well as his wife Julie Moro. The family owns 38 hectares of vineyards in the Châteauneuf-du-Pape AOC and other areas. The Bonnet family also owns 28 hectares of vineyards where they produce white, red, and rosé Côtes du Rhône wines, as well as vin de pays, or ordinary table wine. Finally, Domaine La Bastide Saint Dominique is a vignerons/negociant, i.e. the Bonnet family also buys grapes/wine in bulk from other growers/winemakers. For example, the 2 Hermitage wines we had were negociant wines. Eric Bonnet learned winemaking in Burgundy. He studied enology in Beaune and joined his father in 2000. Eric focusses on the cellar, while his father takes the lead in the vineyard. Bistro Vivant is Bistro/Brasserie in the heart of McLean in the greater Washington DC area. Effective February 11, 2012, Ed Hardy has taken over the kitchen. A native of Richmond, Hardy graduated third in the 2007 class of the former French Culinary Institute in New York. From there, he went on to work for some of the biggest names in the food business. Under Marcus Samuelsson, he was a line cook and sous chef at Aquavit and Red Rooster, respectively; under Gabriel Kreuther, Hardy served as a sous chef at The Modern and MoMa cafes. Most recently, he consulted for the Neighborhood Restaurant Group at the Columbia Firehouse in Alexandria. A fresh, crisp, fruity summer wine with lots of acidity. A white Châteauneuf du Pape. Roussanne and Grenache Blanc. A cuvee made for Eric’s son. Light, bright gold in the glass, notes of peach and white flowers on the nose, a medium-bodied wine, notes of grass coupled with hints of honey on the palate, a round wine with a good finish. Lirac is an AOC along the right bank of the Rhône river in the southern Rhône, situated between Orange and Avignon. It is named after the village of Lirac. On the opposite river bank is Châteauneuf-du-Pape. Medium purple ruby in the glass, notes of Kirsch and black fruit on the nose, fine structure, notes of roast earth, black and red fruit on the palate, long, fresh finish. 75% Grenache, 15% Mourvedre and 10% Syrah. Vacqueyras is an AOC in the southern Rhône wine region, along the banks of the River Ouvèze. It is primarily a red wine region. Located only a few kilometers south of Gigondas, Vacqueyras is often called the little brother of Gigondas. Medium purple ruby in the glass, notes of blue and black fruit on the nose, spicy tannins on the palate, citric tannins mildly coating the insides of the lips, bright finish. In 2008, Eric Bonnet decided to create a new wine and gave it the name Les Hespérides. Deep ruby in the glass, notes of red fruits and flowers intermixed with incense, licorice and ink on the nose, good structure, blending richness and energy smoothly on the palate, excellent clarity and persistent spiciness on the finish. Hermitage is an AOC in the northern Rhône wine region of France south of Lyon. It produces mostly red wine. Syrah is the primary grape. Deep ruby in the glass, notes of plum, meat, and spices on the nose, solid acid/tannin backbone on the palate, full-bodied and mouth-filling, more open, more approachable than the 2005. Deep ruby in the glass, notes of blackcurrant, gunflint and tobacco on the nose, a bigger nose than the 2004, full-bodied with good acidity and sweet tannin, still a bit closed on the palate. Hermitage is typically at its best between 10 and 20 years after the vintage, but the greatest examples from the strongest years can go on for several decades. This one should be put aside for many years. As it turned out, this was Domenico Cornacchia's birthday and there was a small post dinner celebration in a small group. Howard Friedman, Spanish wine aficionado, importer and wine tour guide, put on a great wine maker dinner featuring the wines of Bodegas Bleda, with owner Antonio Jose Bleda Jimenez, who was accompanied by his fiancée Helena Espinosa de Rueda, at Taberna del Alabardero in Washington DC. Bodegas Bleda is a fourth-generation family winery that was founded in 1915 by Don Antonio Bleda in the small town of Jumilla, situated in Eastern Spain. The vineyard area totals 250 hectares. Bodeags Bleda exports most of its wines - only 5% is sold in Spain – to the EU (30%), the US (35%), Asia and Russia. Annual production is 60.000 cases. Most of the vineyard is planted with Monastrell grapes. Antonio Jose Bleda Jimenez: “Monastrell is most suited for Jumilla’s environment. The grapes require a warm climate to ripen and mature and are able to withstand drought conditions. Its fruity concentration, sugars and high level of tannins give our wines an elegant and characteristic personality”. Additional red grape varieties include Tempranillo and Syrah. A field of Cabernet Sauvignon was planted in March 2011. The white wine varieties are Sauvignon Blanc, Macabeo and Airen. Airen has been grown in Spain since the time of the Moors and is the single most planted vine in the world. Its durability under extreme temperatures and dry climates as well as a high yield has made it a popular Spanish choice. It was traditionally used for brandy and heavy, oxidised wines, but modern technology now permits the production of crisp, slightly neutral dry wines marked for early consumption. Macabeo is another native Spanish grape that is grown in Spain and southern France. It is traditionally used to make cava (sparkling wine). Antonio Jose Bleda Jimenez: “Our current headquarters is located in the Valley of Omblancas at an altitude of 650 meters and is overlooked by the Castle of Jumilla.” In 2008, almost 100 after it was founded, the winery was moved to the Valley of Omblancas, where it is surrounded by vineyards at an altitude of 650 meters. Bodegas Bleda ages some of the wines in French and American oak. Antonio Jose Bleda Jimenez is a lawyer by training. He joined his family’s winery in 2009 and is now the General Manager. Howard Friedman is well known to the customers of the Washington DC wine retail store Calvert and Woodley, because he used to work there for many years. A few years ago, after retirement from the retail business, Howard he founded South River Imports and started to import Spanish wine. Also, once a year in September, he takes a group of not more than 20 people to Spain for a wineries tour. This year, his third tour is coming up. If you are interested check out the Calvert and Woodley page. The Taberna del Alabardero is a renowned Basque restaurant in Madrid owned by Luis Lesama - a Madrid classic. The Taberna Del Alabardero in Washington DC (opened in 1989) is his only venture abroad (after Luis Lesama closed Seattle); it is arguably the best Spanish restaurant on the East Coast of the US. In addition to the superb menu and wine list, the decor is impressive and almost screams you will be treated like royalty. The dinner took place in one of the private rooms that feature dark walls, gold embellishments and a pretty chandelier. The dinner was prepared by Chef Javier Romero, who came directly to Washington DC from Madrid about 2 years ago, and was ably orchestrated by Sommelier Gustavo Iniesta. Tasting notes: A pale yellow with intense hints of green color. It has a robust aroma which is elegant, open and diverse, with complexities reminiscent of green and meadows and young ripening fruit. It is well structured on the tasting, fresh and soft, tasty with fruity notes and good aftertaste. Tasting notes: A hazy strawberry pink color. It has a clean and powerful bouquet with an intense aroma of fresh fruit: strawberry and raspberry; with a sophisticated, fruity character. On tasting it is lively, fresh, full of flavor and well balanced. It is well structured. It has a full, fresh aroma and pleasant, fruity after-taste. Tasting Notes: Deep cherry red, this wine has a bouquet of mature fruit, reminiscent of berries and liquorice. On tasting it is flavorsome and well-balanced, and its moderate acidity and lively tannins stand out in the first sip. It has an elegant final flavor with a lasting after-taste which invites a deep enjoyment of the tasting. Crianza: Twenty four months in French and American oak barrels. It finished by fining its structure with the bottle remaining for eighteen months, before being released into the market. Tasting Notes: Magnificent cherry red on a ruby background with dense legs. Complex bouquet with aromas of red berries, stewed fruit and toasty hints. Just the right amount of spicy woody notes. Excellent in the mouth with pleasant tannins and good acidity. The grapes come from old vineyards of Monastrell, harvested during the first week of October 2010. Long maceration of the skinnings of the grape for 21 days. Crianza of the wine: in new French Allier oak barrels of medium toast during nine months. Tasting notes: Very intense and deep cherry red color. Aromas of good intensity with blackberry and blackcurrant, and a pleasant background with new and spicy wood flavor. In the mouth is tasty, rich and with balsamic notes, very powerful with good acidity and noble with well-joined tannins. Ample and remarkable after-tasting with very bright nose aromas. Tasting Notes: Dark red cherry colour with violet borders. Powerful aroma, red and ripe fruit. Tasty, creamy, sweet, ripe tannins, plenty of sweetness and intense fruit concentration.